The truth about moisture resistant carpet padding. Unfortunately, our pets have accidents. It’s just part of life. But do you really need to invest in moisture resistant carpet padding? Here are a few simple truths that you should be aware of before opening your checkbook for this little investment. First, pet proof carpet pad, or moisture resistant carpet padding, does not stop your pet for peeing on the carpet. No matter what the carpet salesperson tells you, it is not a miracle worker. And moisture resistant carpet padding does not magically remove any pet accidents or urine from your carpet. 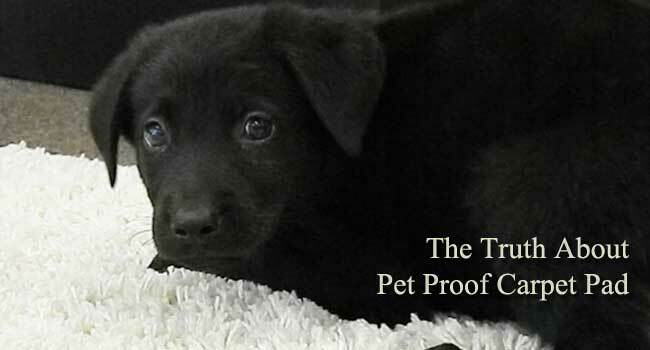 Pet proof carpet pad is carpet pad that has a moisture barrier built into it’s surface. This barrier deters urine and moisture from soaking into carpet pad. That’s it. But here’s the thing – when your pet has an accident the moisture has to go somewhere. So where does it go? When it’s being installed, moisture resistant carpet padding has seams. If the pad it not properly installed, the seams can be vulnerable and provide access for moisture to reach the pad, which acts like a sponge – absorbing all kinds of moisture. As you look into purchasing moisture resistant carpet padding, just remember the pad is only as good as the individual doing the installation. If pet proof carpet pad is installed correctly, the moisture or urine still goes somewhere. Typically, it spreads along the back of the carpet and saturates the carpet fibers. Because of this, moisture resistant carpet padding has the potential to causes more widespread urine damage than urine that soaks into standard carpet padding. If you have a small dog with “little” accidents, then this pad may be a good investment for you. On the other hand, if you have a larger dog, or a pet that wets in the same area frequently, you may be better off with a hard surface flooring. In any case, urine in carpet pad or urine on carpet backing is not good. When urine spreads along the back of the carpet, it can begin to wear down the composition of the carpet, causing delamination – when the carpet fibers detach or separate from the carpet backing. The same goes for urine that remains in carpet padding, it can shorten the life of the pad. If you know that your are bound to have issues with pet urine, you may want to continue your investigation. Purchasing the right carpet padding for your home is an important decision. You’ll simply need to weigh the pros and cons yourself or talk them over with your carpet care professional. The intent of this article is simply shed some light on the fact that moisture resistant carpet padding is not a miracle worker and may not be the best investment you can make for your home.